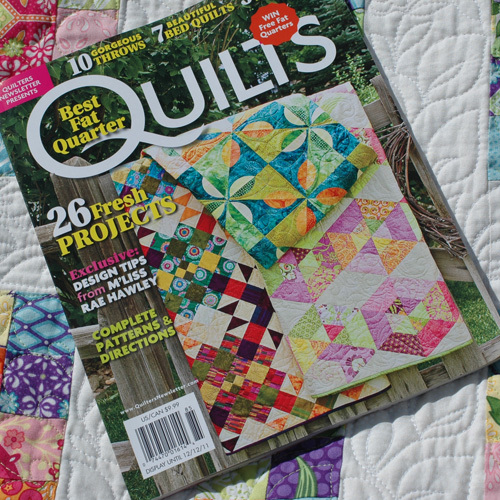 Quilter's Newsletter Special Interest Publication on Fat Quarter Quilts is now on newsstands! I designed a quilt using all the SKUs of Veranda for this issue called "Square Dance". This issue is chock-full of great projects and I have an extra copy to give away! If you would like to enter, please leave me one comment (only one) on this post telling me about your current favorite notion. It can be a particular type of thread, ruler - whatever! Don't forget to leave me a way to contact you should you win. Deadline to enter is the end of the weekend - this Sunday at midnight! Winner will be chosen with the random number generator. As an aside, Fat Quarter shop is kitting Square Dance here! P.S. I just saw a great Veranda giveaway over at Jaybird Quilts too! To enter, comment before 10 pm PST Sat. the 22nd! My favorite notion is my Gingher scissors. I just had them resharpened and they are like butter. Lately I've been loving the Twister template/ruler. I think the pinwheels are so cute and they go together in no time. 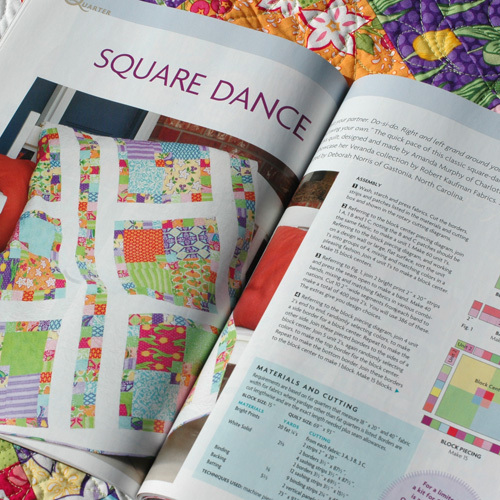 Your quilt in the magazine is gorgeous -- both the pattern and the fabrics! I love my floor lamp. I "requistioned" it from my husband and it pours light over my sewing machine. He is so kind to share! Beautiful! My favorite notion is the sewline air erasable fabric pen :) I'm really into hst's lately and love to use this. My hera marker! it's new to me and I love it! My dresden ruler is the best! Fabric covered buttons :) I have tons of sizes and no clue what I will do with them, but for some reason right now they make me happy! Thanks for the giveaway!! Well, my favorite notion would be a 12.5" square ruler. But I don't have one. I needed one, so I went ahead and made my own... from cardboard. I sure hope to upgrade really soon!!! Thanks for the chance to win this. I think I will buy it if I don't win :) I love Fat Quarter quilts. What a pretty quilt you've designed. My favorite motion right now is the ruler that sharpens your rotary blade as you cut. I can't think of the name right this second! Fiskars scissors sharpener..is my newest purchase. I wanted to spiff up all of my scissors. Don't know if it qualifies as a notion but my GO! die cut machine is my new best friend. Love this thing. What, narrow it to one! Ok I have to admit I have been throwing admiring glances in the direction of my trusty 45mm clover rotary cutter of late..appreciating its predictable cutting prowess and the joy it gives me to sucessfully slice and dice to my hearts content...but it just wouldn't happen at all without the coupling of my hardy and true friend the ruler, an unlikely trio I know but together we keep the reins on the unruly fat quarters that find their way out of my stash. My newest fave notion is my "Line Tamer" ruler for use with my midarm quilting machine. Could not draw straight lines without it! That is a darling quilt -- I'd love to win the magazine! I love your quilt! So summery looking. :-) My favorite notion is my little nipper scissors~ great for thread trimming and works for ripping too. LOL Thanks for the chance! My rotary cutter. It has a hand friendly grip. Beautifull quilt. My favorite notion would be my little nipper scissors too. They are so handy. Thank you for the giveaway. Love the quilt - Thanks for the chance to win a copy of the magazine. I just got a great new seam ripper. I hadn't realized how dull my old one was! I have this fantastic little ruler I forget the name of it, but you tape it in front of the preser foot, and it helps sew flying geese! I used to hate triangles before thsi tool. 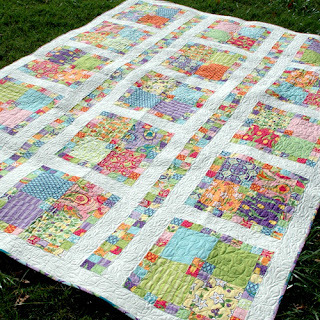 Fabulous quilt - my favorite notion is Sulky thread for decorative quilting. my new fav: the cutting edge ruler! it does sharpen, so saves my blades and having to change them so often, shich makes me grit my teeth. My favorite notion is the Fiskars titanium blade scissors with the spring back handles. It saves on my hands, the points are so very sharp and the blades stay sharp forever! My favortie notion is a centering ruler. I like to to machine embroidery and it makes centering so easy! I've been looking for this magazine, hope I can find it. Well, not sure if this qualifies as a notion, but I love my Go Cutter! My favorite notion is 1/4" quilters tape. My favorite notions is rotatory cutter. My favourite notion today is that "co-operatives build a better world". So, if you're not already a member of a local co-op, go join one or start one. YEAH! Oh? Not that kind of notion? Nevermiiiind!! My favourite SEWING notion these days is ... mmmm ... my very heavy, rectangular vintage looking French General pincushion. Does that qualify as a notion? If it doesn't, how about my new rotating cutting mat that I haven't even tried yet? YOU KNOW I'D JUST LOVE THIS ISSUE! My favorite notion is my 6x12 ruler, I use it to measure everything. Thanks for the chance to win. Right now my favorite notion is my 6 X 24 ruler. So great for cutting strips! I'm loving buttons right now. Big, small, ceramic, wooden, novelty, traditional. Now if only I could come up with a project that actually called for them! Thanks for the giveaway! My 1/4" quilting walking foot. I'd be lost without it! I'm current favorite are the refillable clover marking tools. They come in multiple colors and last forever. My favourite sewing tool is my self-healing cutting mat. I don't know how I ever sewed without one! Today, I should say my favorite notion is my seam ripper because I've used one of my three very often. It does make unsewing easier so I can correct and resew and get on with things. Favorite notion of the moment would have to be my Creative Grid 60 degree ruler... made a few holiday decor items recently! I have lots of favorite notions, but probably the one I turn to the most is my Fiskars ergonomic rotary cutter. I have two - when I misplaced my gray one, I bought a red one - so bright I can't lose it! My favorite notion has always been my clover seam ripper. Nice to hold, razor sharp, always gets the job done. Oh, I'm really not sure this qualifies...My fav new notion is the 78" x 28" formica countertop (from the early 60's) with a 20 drawer cabinet under it! I bought it at a church yardsale last Friday! It will be my new (old) cutting and ironing station. I am way too excited. Hope I can get it in my sewing room soon, but first I have to figure out how to set things up. The room is not very large. Can ya see me grinnin'? Congratulations! I love my rotating cutting mat! Thanks for the giveaway! I'm amassing quite the collection of fat quarters and could really use this issue! My favorite notion is my new walking foot! You know, it would be really hard to beat a good rotary cutter! My favorite notion right now is my rotary cutter. New quilter and I am amazed at what I can cut with that! Thank you for the chance to win. My favorite notion is The Angler 2 that sits on the sewing machine bed. Perfect 1/4" seam every time and I can stitch my bias binding without pinning. My favorite, hands down is my Gingher scissors, could NOT live wihtout them. I would love to win the issue with your quilt. I'd make it right away! My favorite notion would be my gingher scissors, and I'm not sure if my quarter-inch foot for my machine is considered a notion or not...but I love it! Oh I've become such a a ruler junkie lately, especially the creative grid rulers that let you cut triangles after sewing strips together! I think my favorite is my "surgical" seam ripper because I can get at those small stitches. But a word of caution... it is also easy to get a slit because it is sooo sharp. My favorite notion right now is the "Wing Clipper" ruler. I've been making sawtooth star blocks and this ruler helps me make my flying geese almost perfect. Lovely! Thanks for the giveaway, this quilt looks fantastic. My favorite notion right now is Mary Ellen's Best Press starch. 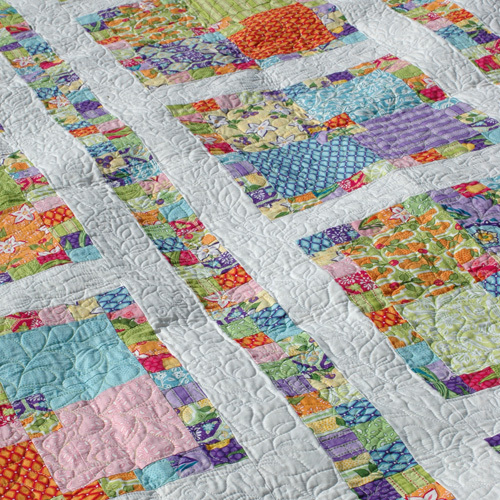 Thanks for the chance to win-I love your Square Dance quilt! I love Gutterman thread. My mom taught me forever ago to use it exclusively. Haven't found anything better! I think the Twister ruler is fun! My current favorite notion(s)are the Lil' Twister tools. I just finished my first table topper using the 5" size and loved it so much I purchased the other three sizes!! Thanks for the chance at this generous giveaway!!! My favorite is my rotary cutter. It seems I always have that in my hand and would not get anything accomplished without it :) Thanks for the giveaway. My current favorite notion is my embroidery marking pen that disappears with water. I had been using one that disappears in air a day after writing with it and it was a race against time to finish a design. My new pen is just wonderful! Without a doubt it is my rotary cutter. They may have been around for awhile but they sure do make life easier for us quilters! Thanks Amanda you are number one! My favorite notion would be the tweezers that came with my Bernina 820. Lovely quilt and fabric! Congratulations on the being published. Pretty quilt. My favorite notion is my rotary cutter. It gets a lot of use and cuts wonderfully! Jeana Kimball Size 11 Straw Needles. I use them for both needle turn applique and hand piecing. They are sturdier and stouter than most size 11s with eyes you can actually get thread through, but still thin enough for itty bitty stitches. My fav notion would have to be one that is on my Christmas wish list - the twister ruler. I love my half square triangle ruler from quilt in a day. Makes things go much faster! I love my Go! and my rotary cutter! My favorite notion is my Gingher scissors, I've had them for over 20 years and they still are as sharp as the day I bought them. Sure would love a copy of that magazine. Thanks for the giveaway. Looks like a great magazine that I would love to won. My newest notion is the Sewline glue pen...love it for my hexies! I use my stylet every time I sit at the machine to sew. It is a very useful tool for me. My rotory cutter is my best friend. The twister template is a runner up of my favorite notions. Your quilt in the mag looks great!! Thanks! I love all of my tools because I only buy the ones that I use most of the time. I don't go out and buy just anything that I have seen I look at it and think of how many times will I use that in the next six months. That way I don't have piles of stuff every where. So I have more money for the things I need like more fabric. Thanks Amanda for this giveaway. My favorite notion is my thread nipper. I bought a titanium-blade rotary cutter and it has quickly become my favorite notion, with its sharpness and precision. Love it! I'd have to say it is my smaller (28mm) rotary cutter: and I'd have to add my acrylic rulers that make the rotary cutter useable!! Love cutting those straight, long cuts!! Thanks for the chance to win the magazine, and I LOVE your Veranda line: so bright and pretty with fantastic designs!! I just recently bought my first ever 1/4" piecing foot! I have always used the edge of my regular foot or moleskin. I love it!! Is this a notion? I've recently discovered Clover's fusible piping! Great for pillows! Currently, my favorite notion is the Nancy Zieman Wrap 'n Fuse fusible piping. It makes pillow-making FUN!! Thanks for the opportunity, kiddo. I guess it would have to be my rotary cutter, so glad I have one! I adore the quilt you got published, congratulations!! My favorite is my Go! Die cutting machine. If I only used it to cut binding and narrow border strips (I don't), it would be well worth the money! I love notions and certainly enjoy finding out about new notions. As such, your question is wonderful. Fun to read everyone's comments. I guess my latest fav is Fiskars titanium blade rotary cutter. Like cutting with a sharp knife thru sliced butter. Smooth, easy, and very durable. I've used and abused and still cuts beautifully. Not sure this is considered a notion but this summer Bernina added a ditch plate for their walking foot. Wow, what a difference! Love at first stitch! Right now my favorite notion is my June Tailor Shape Cut Pro ruler. Anything that helps straighten my cutting is a plus. I'm new to quilting so I don't have alot of tools etc. ( I use my Mom's lol) I do have a pin cushion that my Mom made me recently. Another favorite, my seam ripper. My favorite notion is my rotary cutter. I couldn't imagine cutting with scissors and trying to have it straight. Love your new pattern. Veranda is a beautiful line. Thanks for the giveaway. My favorite notion is a small ruler I have. The only place I've ever seen it is in my LQS. It's 6"x2 1/2". It's just perfect when you need to measure more than an inch but less than 6". I love all your fabric. I follow your blog, you on FB and Twitter. You going to the moon? I'll follow you there. hehe. Thanks for the giveaway and a chance to win some of your beautiful fabric! My favorite notion is my trusty Olfa rotary cutter. My favorite notion is a square ruler I have that happens to measure 8.5 inches - the exact measurement of 80 blocks I'm making now for a quilt. So handy!